When asked to teach a new thematic and material culture version of the survey, at first I felt a bit lost. How can I manage to get through objects of such diverse cultures in one class? Am I assuming an incoming class of freshman already adept at world history? This assumption, I thought, could lead to disaster given the vastly different high school curricula out there. Historical context and social history are usually two aspects I focus on in my classes, and it seems this could possibly be lost for trite groupings of objects under loosely defined themes. Furthermore, with such an emphasis on “objects,” what happens to architecture? The answer, I’ve found, is to take a tip from another discipline: comparative literature. A rather interdisciplinary field in itself, “comp lit” works across cultures to compare how literature in different languages tackles certain themes, creating scholars who are competent in different languages. In the end, this is the goal we all want for our survey students – for them to be competent in “reading” a variety of visual “languages.” By treating thematic groupings as feeding ground for comparative thinking, we can generate a space where students will look at cultural context to understand the formal differences, which also necessarily incorporates architecture. Some great examples I have found exist within the spread of world religion – for example, comparing Byzantine and Islamic manuscripts to emphasize the vastly differing role of imagery in relationship to sacred texts. Another would be to look at the tombs of the great Egyptian pharaohs and the terra cotta warriors from China to discuss the varying roles of militarism and religion in relationship to power and the afterlife. I’ve often had to move around objects within the pre-set thematic groupings in order to do this, but I still manage to address all the required material. Furthermore, through this comparative approach, I can keep material from previous chronological classes that works and plug in my comparisons where they are most effective, maintaining a sense of continuity in a given lesson. When working, as I currently am, without a textbook, we have to find ways to generate comparative thinking before coming into the classroom. 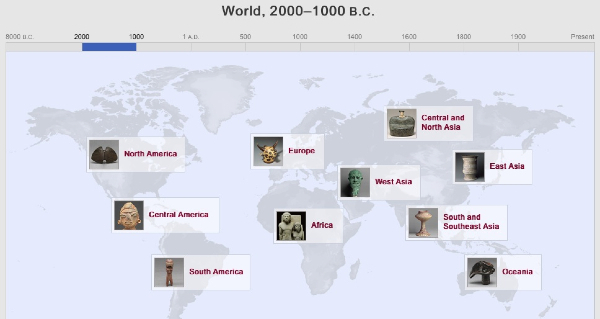 For the weekly assignments, the students read a variety of scholarly essays and reference material, listen to podcasts from the BBC’s A History of the World in 100 Objects series, and occasionally watch relevant films. Some readings build in complexity throughout the semester as well (starting with an essay from National Geographic and concluding with Walter Benjamin). To generate connections between the various topics before class, the students are assigned weekly blog posts. They post entries are of around 250-words each week, often generating useful discussion questions and creating the connections within the assigned material before coming into class. Through regular writing, students practice critical engagement with texts and differentiate between readings of different disciplines and scholarly voices. The blog posts are graded pass/fail and are relatively low-stakes. The remaining writing assignments (two short museum response papers, a group project for an online reference source, and a comparative research paper) build in complexity as the semester progresses. The assignments ask students to write in different voices and take different approaches to objects: a formal analysis of an object at the Met, a personal response to a space at the Cloisters, an online reference source, and a comparative essay. The goal (hopefully) is to get students to identify and analyze different scholarly approaches both through weekly reading and their own writing and to visit local art collections regularly. The class is still a bit of a work-in-progress, being the first time I’ve taught it and the first time it’s been offered at my institution. One area I would like to experiment with more in the second half is in-class small group work for 10-15 minutes at a time. I’ve done a few of these (including an activity on the first day where they had to generate a narrative for an object on their person) with some success. My hope is that this will draw out some of the finer points of discussion and get some of the students who are quieter in the large group to engage verbally. While in many ways I miss the structure of a chronological textbook, the thematic approach allows me to emphasize critical thinking and find ways to generate comparisons across cultures, which ultimately will generate comparisons with contemporary life. In the end, the more we can emphasize how visual human expression is relevant to all of human life and history, the stronger the survey will be. Nice post! I love the way you have integrated active writing into the way students interact and used that to feed discussion in class. I wonder if you have any students express frustration at not having a traditional textbook. Not really! The main challenge is getting them to keep up with the blog. So far, they like the thematic approach – I went even less chronological this week and they said they were still with me and liked the connections.